This early example of Mughal painting depicts a clean-shaven man wearing a long blue robe and a fur hat of European style. He is sitting cross-legged on a rocky shelf by a stream, with only an attentive jackal and ducks for an audience. 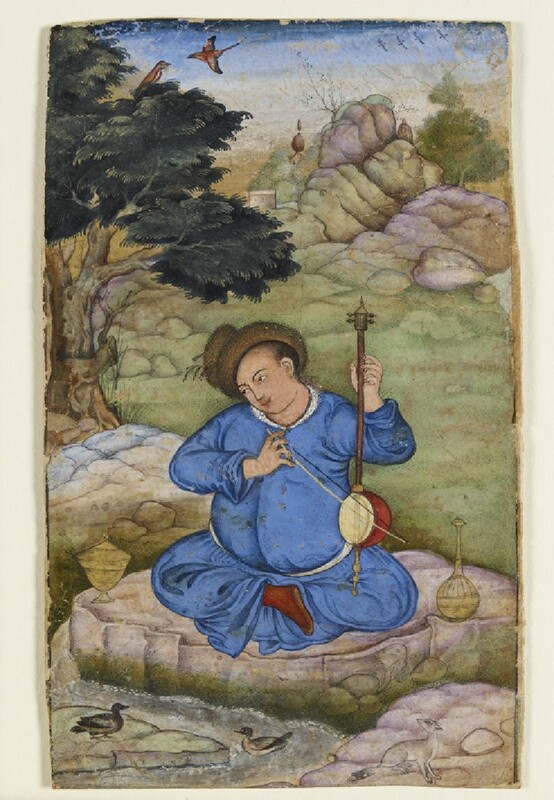 His head is inclined in deep reverie as he plays his kamancheh (a Persian stringed instrument, also popular in Indo-Persian court circles from the 14th to the 17th century). A gold wine flask and covered vessel stand on either side of him. The receding landscape and its pair of birds and ducks are used to emphasize his solitary and introspective state. This painting is attributed to Basawan, one of the leading masters of the Mughal painting workshop under the emperor Akbar (1556-1605). Basawan made a close study of the European prints and paintings which were reaching the Mughal court in growing numbers. Certain aspects about the painting, such as the drawing and handling of the tree foliage, suggest that it was most likely painted at a relatively early phase in his career. Purchased with the assistance of the Neil Kreitman Foundation, in honour of Dr Andrew Topsfield, 2008.